Income tax dept allows you to make TDS on Rent of Property Payments Through Online. Cheques, cash deposit is not required. so you can reduce your long process transactions and save your valuable time. You can make payment at any time (24X7). Eg: If Landlord/Lessor/Payee is resident select "Resident" else select "Non-Resident"
> Enter category and address of Property Letout. 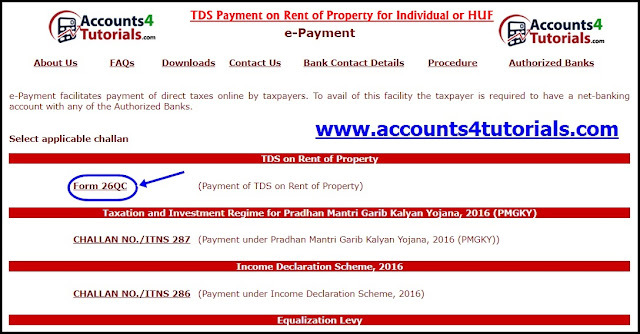 > Basic Tax (TDS Amount to be paid) : Enter TDS Amount to be deposited at the respective Bank. Amount should be entered in the field 'Basic Tax' (Income Tax) on the Bank's web-portal as TDS certificate (Form 16C) will be based on 'Basic Tax' (Income Tax) only. and enter required fields then click on Proceed button and pay the TDS amount. Please feel free to relay your comments, suggestions, questions or corrections. Do now not enter double charges ("") in any of the fields. etax payment immediately will direct the taxpayer to the Net Banking /Debit Card login page. In case the taxpayer wish to opt for etax payment on subsequent date, ACK No. will get generated and the same has to be retained by taxpayer and presented to any of the authorized Bank for further payment. Provision to enter Tax amount (i.e. Basic Tax, Interest and Fee) is given in the Bank's website. Period of Tenancy will be the period (i.e. months) for which tenant is paying the rent. Total value of Rent Payable is equal to the no. of month for which rent is payable * value of rent per month. If Date of deduction is greater than Date of Payment/Credit, the same may result in Demand Notice for late deduction. If Date of deduction is less than Date of Payment/Credit, the same may result in Demand Notice for late deduction. If Date of furnishing Form 26QC is beyond prescribed due date, the same may attract late filing fee u/s 234E.